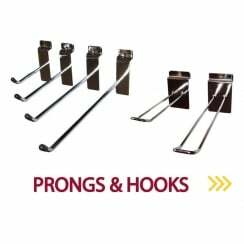 Metal prongs, plastic hooks, easels, china stands and much much more... Take a look at this great range of general purpose retail displays. If you are looking for shop equipment of the highest quality then relax… the best quality shop equipment is in plentiful supply on the 3D Displays website. When space is limited it is imperative that any available space is used in the most efficient way. The shop equipment available from stock right here on this website can be used to add height to your displays giving a whole new dimension. The shop displays available from 3D Displays will most certainly help you to achieve this. The mirror acrylic displays will also effectively double your merchandise! 3D Displays have specialised in manufacturing and supplying perspex shop equipment to the retail sector, museums and galleries for over 40 years. With this level of expertise and highly trained acrylic fabricators there really isn't anywhere else you should be buying your perspex shop displays. Perspex shop displays are hugely versatile in their subtle yet somehow eye catching minimalism. But it is not just perspex shop equipment where our expertise lies. We manufacture shop equipment from acrylic, PETG and PVC. No shop could consider itself complete until they have made the investment in a good set of shop displays…. 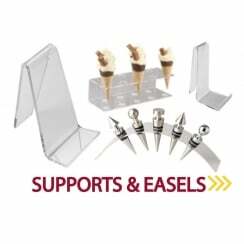 And 3D Displays is your one stop shop stocking slatwall panels, metal hooks, shelving and general perspex shop displays. Whilst this display equipment is frequently referred to as shop equipment it isn’t only suitable for the retail sector. Shop equipment can also be used in galleries, museums, offices and even as contemporary home accessories.